Howard brought in all four of his targets for 68 yards and a touchdown in the Buccaneers' 37-34 loss to the Bengals on Sunday. Howard brought in five of nine targets for 67 yards in the Buccaneers' 26-23 overtime win over the Browns on Sunday. Howard caught all four of his targets for 62 yards and a touchdown during Sunday's 34-29 loss to Atlanta. Analysis: Howard cut into the Falcons' lead just before halftime, catching a Jameis Winston loft in traffic for a 10-yard touchdown. It was a rebound performance for Howard, who was held catchless in Week 4 and has been hobbled with a knee injury. The talented tight end shone in Winston's first start of the season and figures to serve as a security blanket next Sunday against a Cleveland defense that is adept at pressuring the passer. Howard (knee-MCL) is active for Sunday's Week 6 divisional showdown against the Falcons, Scott Smith of the team's official site reports. 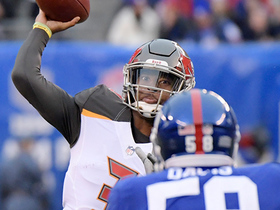 Analysis: Jameis Winston will thus have a full complement of pass catchers to lean on in what is expected to be a high-scoring shootout against the suspect Falcons pass defense. Howard is slated to slide right back into the top tight end job, relegating Cameron Brate to more of the secondary role he's filled so far this season. Howard (knee), who is listed as questionable for Sunday's game against the Falcons, is expected to play in the contest, Adam Schefter of ESPN reports. Analysis: Howard was believed to be trending in this direction after he was a full participant at practice Friday following limited showings Wednesday and Thursday. Assuming he checks out fine during pregame warmups, Howard should draw the start at tight end, though his snap count could be more limited than normal while he returns from an MCL sprain. Howard's likely availability will put a damper on Cameron Brate's fantasy outlook. Howard (knee) was a full practice participant Friday and is listed as questionable for Sunday's game in Atlanta, Jenna Laine of ESPN.com reports. Analysis: Howard followed a pair of limited practices with a full session, hinting that he's on the right track to suit up for Sunday's potential shootout. However, he was still wearing a bulky brace over his knee for the final practice of the week, and he'll be just two weeks removed from suffering an MCL sprain come Sunday. The Bucs may scale Howard's role back if he does indeed end up active ahead of Sunday's 1:00 PM ET kickoff. Cameron Brate would stand to benefit if Howard is limited or unavailable. Howard (knee) was limited in practice Thursday, Jenna Laine of ESPN.com reports. Analysis: Howard has made appearances in both post-bye practices, thrusting him into the will-he-or-won't-he play Sunday in Atlanta. Handed a timetable of 2-to-4 weeks to recover from an MCL sprain on Oct. 1, he's given himself a chance to do so, but ultimately the decision will be made by the Buccaneers' medical staff, per Greg Auman of The Athletic. If Howard isn't ruled out on Friday's injury report, he almost certainly will be a game-time call for Sunday's 1:00 PM ET kickoff. Howard (knee) practiced in a limited capacity Wednesday, Greg Auman of The Athletic reports. Analysis: During the Week 4 loss to the Bears, Howard sustained an MCL sprain that was projected to keep him out for 2-to-4 weeks. With an ensuing bye week, the Buccaneers' schedule appears as if it will benefit the tight end. Even if he doesn't progress beyond a limited practice session Thursday or Friday, Howard has put himself on track for a potential appearance Sunday in Atlanta. Howard (knee) is participating in practice Wednesday, Rick Stroud of the Tampa Bay Times reports. Howard (knee) is wearing a heavy brace and won't take part in Monday's practice, Jenna Laine of ESPN.com reports. Analysis: Howard suffered his MCL sprain ahead of a bye, but the estimated recovery timeline of 2-to-4 weeks suggests he's still likely to miss at least one game. His expected absence for Week 6 in Atlanta will leave Cameron Brate as the top tight end for Jameis Winston's first start of the season. Howard (knee) is expected to miss 2-to-4 weeks after being diagnosed with an MCL sprain, Adam Schefter of ESPN reports. Analysis: Howard was removed from Sunday's loss to Chicago late in the first half, thus falling shy of 50 yards for the first time in four games this year. His absence freed up more snaps for Cameron Brate, who responded with three catches for 29 yards and a touchdown on four targets. The timing of the injury is at least convenient for Tampa Bay as the team prepares for a Week 5 bye. Brate figures to take on a heavy snap workload when the Bucs return to action for a Week 6 game in Atlanta. Howard (knee) is scheduled to undergo an MRI on Monday, but the Buccaneers do not believe the tight end sustained a serious injury, Adam Schefter of ESPN reports. Analysis: Howard exited Sunday's game against the Bears late in the first half with an apparent knee injury. It won't be known if he needs to miss time until Howard undergoes further testing Monday, but the team's optimism is at least a good sign that the tight end avoided anything that might require a long-term absence. 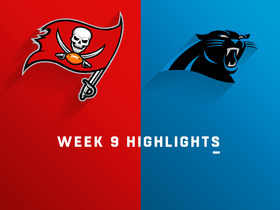 The Buccaneers conveniently are on bye Week 5, providing Howard with roughly two weeks to be ready for the team's next game Week 6 against the Falcons. 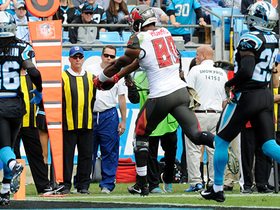 Howard (knee) won't reenter Sunday's game in Chicago, Scott Smith of the Buccaneers' official site reports. Analysis: Howard was removed late in the first half with what was deemed a knee injury, which is severe enough for the Buccaneers to rule out the tight end for the rest of the contest. An upcoming evaluation should hone in on its nature and subsequently yield a diagnosis. 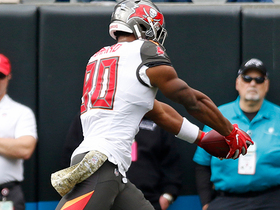 While Howard is sidelined, the Bucs will turn to TE Cameron Brate for first-team reps.
Howard is questionable to return to Sunday's game at Chicago due to a knee injury. Analysis: Howard has been far more reliable in his second pro season, reeling in 11 of 14 passes for 222 yards and one touchdown through the first three games. On Sunday, though, the Bucs were down 35-3 when Howard departed in the second quarter with no catches (on three targets) to his name. Cameron Brate will be the primary tight end as long as Howard is absent. Howard caught six of eight targets for 72 yards in Monday night's 30-27 loss to the Steelers. Howard brought in three of four targets for 96 yards and a touchdown in the Buccaneers' 27-21 win over the Eagles on Sunday. 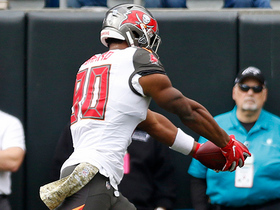 Howard brought in both of his targets for 54 yards in the Buccaneers' 48-40 win over the Saints on Sunday. Howard brought in two of four targets for 31 yards in a 30-14 preseason win over the Titans on Saturday. Howard played 13 snaps in the Buccaneers' 26-24 preseason win over the Dolphins on Thursday but was not targeted. Howard made several impressive plays during Wednesday's practice, Carmen Vitali of the Buccaneers' official site reports. Howard is slated to catch passes from backup quarterback Ryan Fitzpatrick for the first three games of the 2018 regular season in the wake of Jameis Winston's expected suspension for violating the NFL's personal conduct policy, Jenna Laine of ESPN.com reports. Howard (ankle) said Thursday that he is a full-go moving forward, Scott Smith of the Buccaneers' official site reports. Analysis: Howard ended his rookie season on injured reserve after suffering a right ankle injury in a Week 15 loss to the Falcons. However, after four months of rehab, the former Alabama standout should be a full participant in the rest of the Buccaneers' offseason activities. 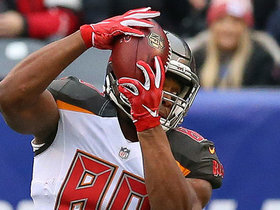 He finished his rookie year with 26 catches for 432 yards and six touchdowns, and after starter Cameron Brate re-signed with the team this offseason, Howard will likely continue to split reps at tight end this season. 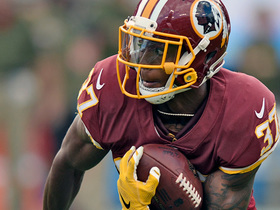 Howard (ankle) should continue to grow in a role that's different from that of teammate Cameron Brate, who recently signed a six-year, $41 million contract that includes $18 million guaranteed, ESPN.com's Jenna Laine reports. 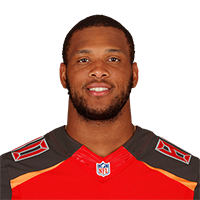 The Buccaneers placed Howard (ankle) on injured reserve Wednesday, Jenna Laine of ESPN.com reports. Howard (ankle) is expected to be placed on injured reserve this week, Rick Stroud of the Tampa Bay Times reports. Analysis: Howard was unable to return to Monday's 24-21 loss to the Falcons after sustaining a right ankle injury that confined him to a walking boot. The Buccaneers will likely have Howard undergo an MRI on Tuesday to determine the extent of the injury, but it sounds like he could be dealing with a serious enough of a sprain to sideline him for the final two games. Cameron Brate, who suffered a knee injury of his own Monday, would see an uptick in snaps at tight end if Howard is shut down for the season. Howard (ankle) was wearing a walking boot on his right foot after Monday's loss to the Falcons, Greg Auman of the Tampa Bay Times reports. Analysis: Howard raced along the sideline for a 30-yard touchdown in the first half, but sustained the injury as a Falcons' defender attempted to force him out-of-bounds. 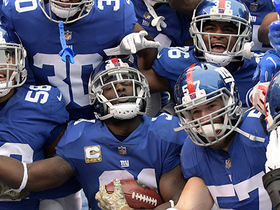 It was the rookie first-round pick's only catch of the game as he was ruled out shortly thereafter. More specifics should become available on the injury as Howard is evaluated throughout the week. Howard (ankle) has been ruled out for the remainder of Monday's game against the Falcons. Analysis: There's no word on the exact nature of Howard's injury. With Cameron Brate (knee) also on the shelf, the Buccaneers will proceed forward with Antony Auclair and Alan Cross at tight end. Howard injured his ankle and is questionable to return to Sunday's game against the Falcons, Jenna Laine reports. Analysis: The Buccanneers are already without Cameron Brate, who departed with a knee injury earlier in the first half. If Howard isn't able to return, Tampa Bay will need to make due with Antony Auclair and Alan Cross at tight end. Howard brought in four of six targets for 54 yards and a touchdown in Sunday's 24-21 loss to the Lions. He also lost a fumble. Howard brought in one of two targets for 17 yards in Sunday's 26-20 overtime loss to the Packers. Howard brought in three of four targets for 52 yards in Sunday's 34-20 loss to the Falcons. 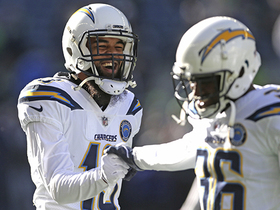 Howard brought in three of four targets for 52 yards and a touchdown in Sunday's 30-20 win over the Dolphins. 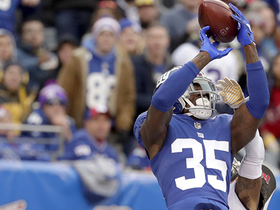 Howard secured one of two targets for six yards in Sunday's 30-10 loss to the Saints. He also lost a fumble.